This technique must really work. I’ve received dozens of similar reports on hanging clear plastic bags of water and completely eliminating fly problems and it seems to be growing in use. What an “expert” from my area claimed was that the fly mistook the bag as a large spider web. Something about the way the water bulging in a clear plastic bag causes a prism effect and confuses the fly. Who knows what a flies think. Maybe they just don’t feel comfortable flying around a place that hangs up bags of water. The rounder and plumper you can get the bag, the better fly control. Do not let the bag get dusty or dirty. Some people recommend putting a few pennies in the bag, but water without the pennies seems to work. Another theory: Houseflies are defenseless, nervous and don't like to sit still when they see something moving nearby, because it could be a predator. 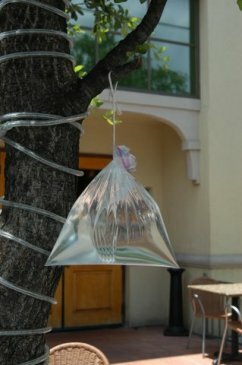 Water bags act like a lens where the movements of people and plant foliage in the area are reflected. Even the shifting of light and dark in the water bag, could be interrupted as dangerous movement. Other insects aren’t bothered they don't have eyesight that’s as good. Basically it must distort what the flies are seeing and confuses them. See related article: Can a bag of water keep the flies away? Products for pest control, lawn and garden care are available in independent garden retailers that stock natural organic products.